Because D. pteronyssinus and D. farinae house dust mites are the most studied species we have developed a mixture of both species. The mixture is available as an extract but also as a whole culture of mites. Dermatophagoides farinae and Dermatophagoides pteronyssinus are insects from the class arachnid. Combined with Euroglyphus maynei these 3 species account for 70-92% of the mites which are present in households. House dust mites are the most prevalent source of indoor allergens. Approximately 1-2% of the world population suffers from house dust mite allergy. Studies across the US, Europe, Asia, South America, New Zealand, Australia and Africa have shown that the house dust mites are present globally. The type of mite and the numbers differ per region. This is mainly due to the humidity and temperature per region. The majority of house dust mite allergy patients are both sensitized to D. pteronyssinus and D. farinae. The allergens from both of these species are almost always present in house dust samples in temperate areas. 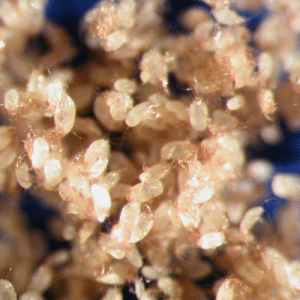 Various researchers have described the common allergenic extract components of dust mites. These studies showed that the IgE cross-reactivity between the major allergens Der p 1 and Der f 1 and between Der p 2 and Der f 2 is higher than 80%. Both species contain a significant amount of identical or very similar epitopes that cause immunological cross-reactions. Our products will be delivered in freeze-dried (lyophilized) form. Please contact us for pricing and availability.